Compete Magazine and Orbitz will honor Dr. Jennifer Welter at the 2017 Compete Sports Diversity Awards, also known as the 8th Annual Petey Awards, in Kansas City, Missouri on November 10th. Welter is known as the first-ever female NFL coach, signing with the Arizona Cardinals in 2015. The same year she was also the first woman to coach in a men’s professional football league. Prior to these two coaching positions, she was signed as a running back on a men’s professional football team. In another “first,” Welter became the first woman to play a “contact” position in the male-dominated sport of football. 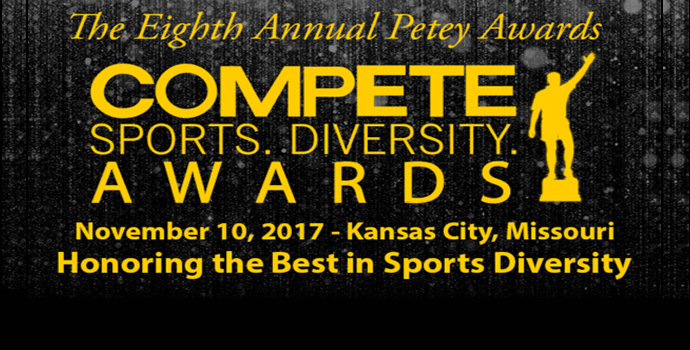 The 8th Annual Petey Awards is being held on Friday, November 10, 2017, at the Westin Crown Center. A VIP welcome reception begins at 6:00 p.m. with dinner seating at 7:00 p.m. Early-bird, general admission tickets are available for $125 and VIP tickets for $175. Additional information on this year’s event can be found online at sportsdiversityawards.com. Compete, launched by Media Out Loud in 2006 is an innovative leader in the sports diversity movement of Inclusion, Diversity, Equality and Acceptance (IDEA). Compete is the world’s first and only LGBTQ+ sports, fitness, health and lifestyle media brand. As an early sports diversity leader, Compete fulfills its mission of “Uniting the World Through Sports” by reaching a diverse global audience through its platform of media properties encompassing print, digital, online, radio and events, including the annual Petey Awards. To find out more about Compete Magazine please visit www.competenetwork.com. How Much Effort Into Diet vs. Exercise Should You Put In?